This approachable, easy-drinking red offers juicy cassis, plum and earthy fruit flavors accented with white pepper and spice. This wine shows inviting aromas of juicy black fruit, mulberries, plums and hints of warm spice. After spending 18 months in barrel, the palate is soft and juicy with well-rounded tannins and a long, delicious finish. Wood Maturation - All components 18 months in 2nd, 3rd and 4th fill barrels. Although this wine is already drinking well, it will reward further cellaring. 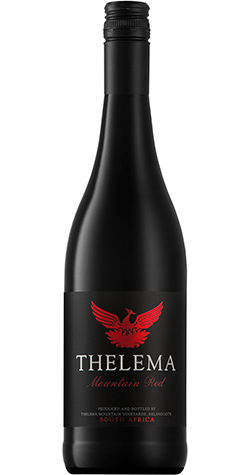 Thelema, situated on the spectacular Helshoogte Pass in Stellenbosch, is a family owned and managed wine estate and the home of Thelema and Sutherland Vineyards wines. Gyles Webb bought Thelema, a charming dilapidated fruit farm, in 1983 with the help of his wife’s family. Fruit orchards were pulled out and vines were planted. The manor house was restored and the first wines under the Thelema label were released in 1988. The ripe pure-fruited wines were a revelation to many and it wasn’t long before the romantic tale of a run-down old fruit farm became the success story of an avant-garde winery. By the mid 90's Thelema’s wines sold out within a month after release, making it one of the most sought-after wine estates in South Africa. The high altitude and the deep red soils are ideal for premium quality wine grape production. "We do not buy in any grapes and all wines are bottled on the estate to maintain absolute control over every aspect of the wine production. The terroir in combination with Gyles Webb’s winemaking style results in flavourful, flamboyant, complex and long-lasting wines with a distinctive South African character. In 2000, Gyles moved into the role of cellar master and handed over the winemaking duties to the talented Rudi Schultz (one of the famous Schultz winemaking brothers). We hope you enjoy our wines and it would be a pleasure to welcome you at Thelema for a chat and a taste of our latest release."